A little moment of creative pondering over breakfast... The quilt mum made for my cot when I was a babe... it needs some mending... And the first instalment of my birthday present!! A subscription to selvedge! I'm in love. Its all about quilts this issue, which has been the main topic of crafty conversation around here too. Quilty plans afoot. See some more lovely spaces at Kirsty's. Sweet quilt, enjoy the gardens. Those are always a joy to visit! 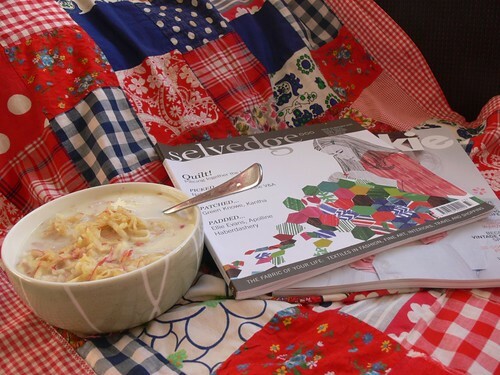 Red, white and blue just look so fantastic together and I love the simpleness of the quilt. You were one lucky babe to have such a quilt. beautiful quilt and sucha cozy picture. I hope you enjoy your day at the gardens. That quilt is beautiful, you will definitely have to hold on to it and eventually pass it on to you kids. Have a great day in the botanic gardens. thid id great you still have it ! how precious ! i've heard a lot about "selvedge" but never got to read it (i live in France) hopefully one day ! Very sweet quilt. I've been thinking a lot about quilts too, I would dearly love to make one for my little miss, just can't decide on the fabrics. lucky you to have that sweet baby quilt. I was looking enviously at that quilt of yours and thinking "awesome looks vintage, I love it" and then you explained that it was truly vintage. What a beautiful gift from your mum. oh! your quilt is lovely - the blue red and white is just beautiful! How beautiful that you still have the quilt. Hope you had a lovely day at the gardens.